Look how cute this popcorn-made Christmas tree. And the best part is, it not difficult to make at all! 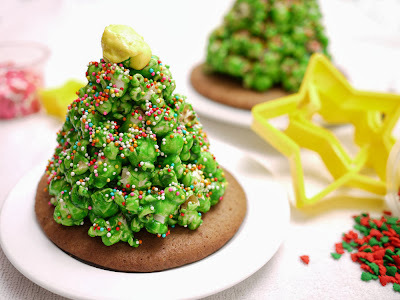 You only need a few pieces of cookies as the base of the tree, and popcorn to be stacked as a Christmas tree. The creative ideas of CruStABakes popped accidentally while she was trying to make caramel popcorn. Suddenly, she thought to stack it together and it immediately formed a mini Christmas tree. With yellow icing sugar on top of the tree and sugar sprinkles, CruStABakes succeeded in creating her tiny Christmas tree. Want to try it out? Here is the full recipe completed with some tips from CruStABakes. Pop the popcorn according to the package instructions. Coat a large mixing bowl with nonstick cooking spray, and transfer the popcorn from the bag to the bowl. Set aside. In a small saucepan, whisk the sugar, corn syrup, butter, salt and 2 tablespoons of water, and bring to a simmer over medium-high heat. Continue to simmer, stirring often, until the mixture reaches 250 degrees F on a candy thermometer, 3 to 4 minutes. Turn off the heat, and whisk in the vanilla and baking soda. Immediately pour the hot mixture over the popcorn. Use a rubber spatula to gently fold the caramel into the popcorn until all of the popcorn is coated. Gently stir in the peanuts, and transfer the mixture to the prepared baking sheet. Bake for 1 hour, stirring every 20 minutes. Remove from the oven, and cool on a wire rack for 20 minutes. Gently break up the popcorn. Serve immediately, or store in an airtight container for up to 5 days. CruStABakes used a gingerbread cookie as the base. To make the popcorns green, substituted the white sugar for the brown sugar in the recipe, and stirred in green coloring after the baking soda went in. Shaped the popcorns into its conical shape and placed them on a baked gingerbread cookie. The semi molten sugar will adhere itself to the base. Sprinkled the trees with sprinkles first before popping them into the oven to dry out. If you sprinkle after the oven time, the sprinkles won’t stick as the sugar has already dried.